POSITION: General manager, Napleton AutoWerks, Loves Park and Rockford, Ill.
Geoff Feinblatt fondly recalls the mentoring he received at a suburban Chicago Toyota dealership where he washed and detailed cars during high school and college. It helped persuade him to pursue a career in auto retailing. Now Feinblatt is general manager for Mercedes-Benz, Audi, Porsche, Honda, Subaru, Jaguar and Cadillac outlets in Loves Park and Rockford, Ill., and he's using the same approach. 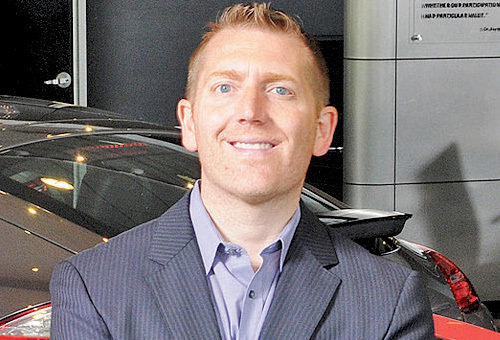 Feinblatt has made a priority out of communicating, rewarding and motivating his college-age employees at the seven-franchise AutoWerks chain, which is part of Napleton Automotive Group of Chicago. "I know how important it was when I was 19 or 20 years old -- I personally experienced it," he said. "If my employees are happy my clients are happy." Feinblatt caught the car bug at an early age, visiting his grandfather in Detroit where the pair tinkered with 1960s and '70s muscle cars. His favorite was the 1970 Chevy Chevelle LS. His attraction to cars led to that first job as a washer/detailer. After graduating from Northern Illinois University in 1998, Feinblatt started out as a salesman at McGrath Honda in Elgin, Ill., and worked his way to general manager of the Honda store in 2002. Feinblatt has been with AutoWerks since 2004 and took the helm of the seven franchises in 2007. Those stores sold 2,000 new cars and 1,110 used vehicles last year. He says he tries to "touch base" every day with as many of the 120 employees under his supervision as possible. The dealerships have extensive employee programs, including one-on-one coaching and mentoring. It's no surprise that Feinblatt is mentoring several young employees himself. He said: "They have the ambition of having my job at my dealership or other dealerships."